Lal Mohan, a daily wage labourer, has no clue what took his wife’s life. Sarita Devi, 25, was expecting her third child, and was on way to a good hospital at Bhagalpur district in Bihar. “She was normal all through the nine months of pregnancy,” he says. “When labour pains began, we took her to a community health centre (CHC), 15 km from our house in Godda district in Jharkhand. At around 11 pm, doctors advised us to take her to Sadar Hospital, 20 km from the CHC. Here again, doctors referred her to Jawaharlal Nehru Medical College and Hospital in Bhagalpur, another 70 km away.” She passed away on the way to hospital. Sarita’s death is not a one-off case. In a year, hundreds of women die during or after pregnancy in the Santhal Pargana region, where Sarita lived. Child marriage is rampant in the region and girls usually become pregnant at the age of 16, says Soumik Bannerjee, health activist in Godda. Their undernourished bodies are ill-prepared for travelling to faraway places during labour pains, that too under no medical supervision or advise. Small wonder, Santhal Pargana has a high maternal mortality ratio (MMR), of more than 300 deaths per 100,000 live births, he says. This is the result of the government’s focus on only institutional deliveries, says Shakeel Ur Rehman of Bihar-based non-profit Centre for Health and Resource Management (CHARM). The government has based all its programmes for expecting mothers on the belief that women can be safe during and after childbirth only if they have access to public health institutions, he says. Programmes like Janani Suraksha Yojana even give cash incentives to women who deliver their babies in hospitals. It allocated as much as Rs 1,700 crore for the programme in 2011-12. Though the country has been able to reduce its MMR from 212 in 2009 to 178 in 2012, it may not be able to achieve its Millennium Development Goal (MDG). In 2000, the international community had pledged to bring down MMR by one- third. 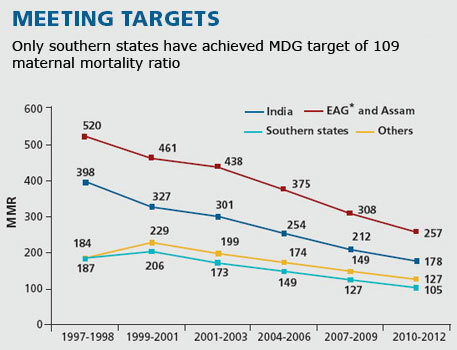 For India, the target was to reduce MMR to 109 by 2015. To overcome the challenge, member of the Planning Commission Syeda Hameed suggested National Alliance for Maternal Health and Human Rights and Oxfam (international confederation of organisations working to find solutions to social injustices) to present their recommendations to the plan panel. The organisations are now finalising the recommendations (see ‘Experts’ recommendations’). The plan panel is set to do mid-term appraisal of the 12th Five Year Plan within a few months. Implementation of the recommendations should be able to reduce MMR, she said at a national convention held recently in New Delhi. Reduction in the country’s MMR is most likely because of under-reporting of deaths, says Rehman. CHARM is currently conducting a survey at public health centres in Bihar. The non-profit has found a big gap between government data and the actual MMR. Phulwari Sharif in Patna has reported zero deaths, but the non-profit found 14 deaths in the block in a month. “The focus is only on achieving targets on paper,” he says. At present, Assam has the highest MMR of 328 in the country followed by Uttar Pradesh and Uttarakhand together at 292, according to a recently released report of the Registrar General of India. Madhya Pradesh, Chhattisgarh, Odisha, Rajasthan, Bihar and Jharkhand have MMR of 200 and above. South India, however, has shown remarkable progress. Kerala has pushed its MMR down from 150 in 1997-98 to 66 in 2012. Tamil Nadu has reduced it from 131 to 90 and Andhra Pradesh from 197 to 110 in the same period (see ‘Meeting targets’). “South Indian states improved their MMR because they have more or less sorted out issues like nutrition and hygiene, which have a big influence on safe delivery,” says Ritu Priya Mehrotra, professor at the Centre of Social Medicine and Community Health, Jawaharlal Nehru University, Delhi. Public health system is strong in these states. “It is strange that the government has initiated programmes focused on public health institutions without improving medical facilities and infrastructure there,” says Abhijit Das, director of Centre for Health and Social Justice, a New Delhi-based non-profit. The need is to take a multi-pronged approach, says Smita Bajpai of Gujarat-based non-profit Centre for Health Education, Training and Nutrition Awareness. “Unless the focus shifts to the root cause of the problem, it will not be resolved. Improvement is required in every sector—transport, infrastructure, nutrition and employment,” she adds. A CHARM study on maternal deaths in Bihar found 22 deaths in Phulwari Sharif and Maner blocks between 2012 and 2013. Of these, 15 women died while being taken to health centres in autorickshaws. Two were on foot. Delay in decision-making and reaching health centres was the reason for most deaths, the study states. States should improve access to free ambulances, it says. In a country like India where midwives still cover 50 per cent of the deliveries, home delivery gets no support from the government, says Das. In the 1920s, developing countries such as Denmark and the Netherlands supported home deliveries and had lower MMR than developing countries like the US and New Zealand which believed only in institutional deliveries, he says. Sri Lanka managed to reduce its MMR to 60 in 2008 by widely using midwives for home deliveries and strengthening the health system. Centre for Global Development, a US-based research organisation, states that 97 per cent of the births in Sri Lanka are attended by skilled midwives. It also provides free medical services to all. “India cannot provide medical service to all in public institutions. 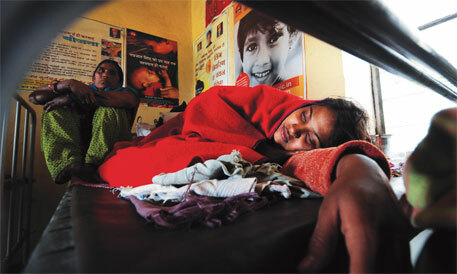 In such a scenario, how justified is it to promote only institutional deliveries?” wonders Mehrotra. She suggests integrating midwives, accredited social health activists (ASHAs) and auxiliary nurse midwives (ANMs) for delivery cases. ASHAs can counsel pregnant women; midwives, with their knowledge of the female body, can identify critical cases and perform normal deliveries; and ANMs can coordinate with health centres for institutional deliveries. To improve the situation, the government should shift the debate from home delivery versus institutional delivery to safe delivery versus unsafe, says Rehman.